On Monday afternoon, President Trump tweeted that he would nominate Acting Interior Secretary David Bernhardt to lead the Interior Department, the agency responsible for managing our nation’s parks and public lands. Bernhardt, a Colorado native, joined the Interior Department in 2017 as Secretary Ryan Zinke’s second-in-command after years of serving as a lobbyist and attorney for scores of oil and gas industry clients. Here’s everything you need to know about Trump’s pick to be the next Interior Secretary. Before joining the Trump administration, David Bernhardt represented dozens of oil and gas industry clients as an attorney and lobbyist. Financial disclosures and ethics recusals show that Bernhardt’s clients included oil companies like Halliburton Energy Services and Eni Petroleum, international mining corporations such as Hudbay Minerals, Inc., along with industry trade associations such as the Independent Petroleum Association of America. Bernhardt also litigated against the Interior Department on behalf of the nation’s largest offshore drilling trade association. According to a profile in the Washington Post, Bernhardt has so many conflicts of interest that he carries a notecard in his jacket pocket to remember them all. Upon seeing President Trump’s tweet, Bernhardt’s former oil and gas clients sent press releases celebrating his nomination. 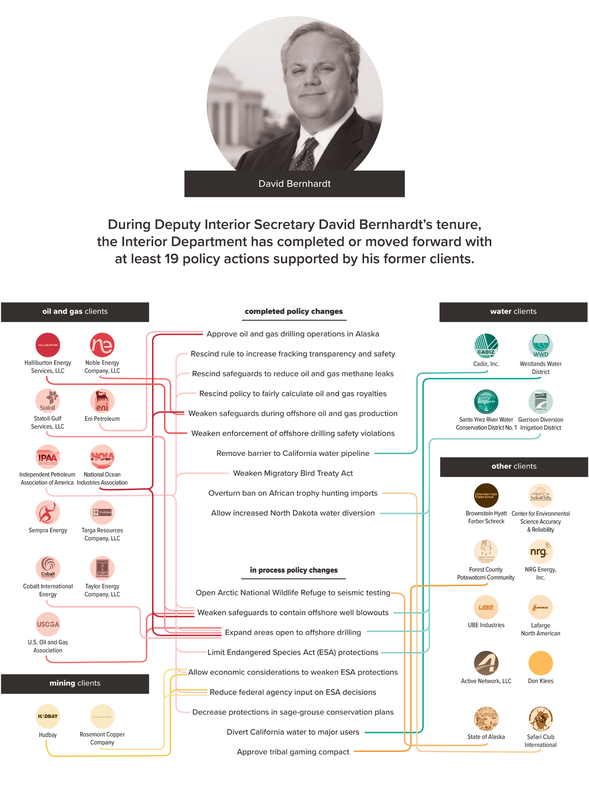 An analysis by the Center for Western Priorities found that during Bernhardt’s tenure as Deputy Interior Secretary, the agency completed or moved forward with at least 19 policy actions that were requested or supported by at least 16 of his former clients. These policy proposals include stripping protections for wildlife under the Endangered Species Act, approving oil and gas operations in the Alaskan Arctic, and aggressively expanding drilling on public lands across the West. After Ryan Zinke resigned as Interior Secretary, David Bernhardt became acting head of the agency on January 2, midway through the historic government shutdown. Under Bernhardt’s command, the Interior Department formally changed its shutdown plans, recalling employees to process drilling permits, both offshore and throughout the Mountain West. An analysis found that dozens of drilling permits approved during the shutdown were for companies that serve on the boards of major trade associations that were recent clients of David Bernhardt. According to data from the Bureau of Safety and Environmental Enforcement, 71 offshore drilling permits were approved during the shutdown. 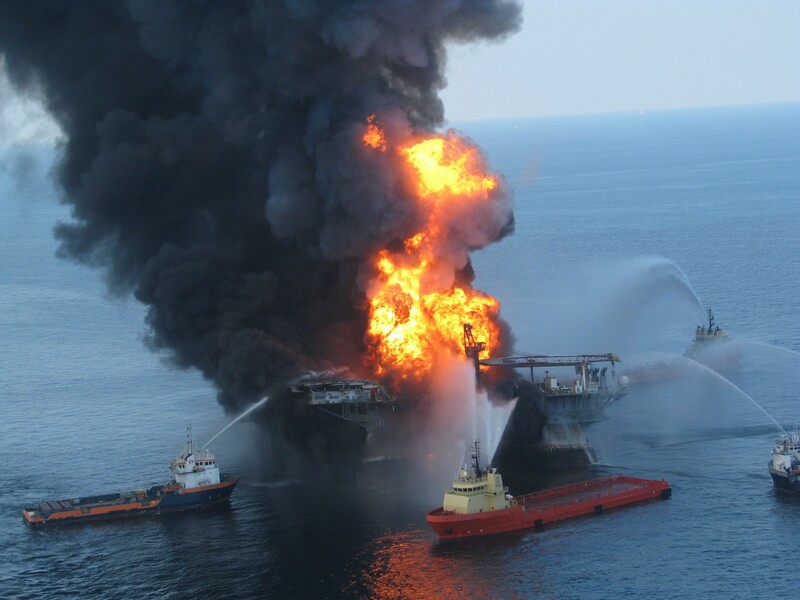 Of those, 53 permits were for companies that sit on the board of directors for the National Ocean Industries Association (NOIA), a major offshore drilling trade association and former Bernhardt client. Similarly, of the 38 onshore drilling permits approved by the Bureau of Land Management during the shutdown, 20 were for companies that sit on the board of directors of theIndependent Petroleum Association of America (IPAA) or affiliates of the U.S. Oil and Gas Association (USOGA), both former Bernhardt clients. A new poll released by the Center for Western Priorities finds voters in Colorado, Bernhardt’s home state, reject his oil and gas-centric approach and want to see more balance in public land management. When asked what mattered most for the Interior Department under David Bernhardt, nearly three-quarters of respondents (74%) said the agency must do a better job striking a balance between preserving public lands and responsible energy development. Just 18% said what mattered most was increased oil and gas development, and only 3% said having a Coloradan running the department was most important. Additionally, the poll found that 77% of Colorado voters are concerned that clients Bernhardt previously lobbied for have business before the department he currently runs. David Bernhardt’s nomination to be the next Interior Secretary will now be considered by the U.S. Senate, where he may face a tough confirmation fight. While he was narrowly approved as Deputy Interior Secretary with 53 votes, Bernhardt’s track record since joining the Trump administration has been sharply anti-conservation and pro-drilling and mining. As his nomination moves forward, it will be critical for Senators to assess Bernhardt’s deference to drilling and mining interests and preference for extraction over conservation. Even a quick review of his past as an oil and gas lobbyist should make it abundantly clear — a walking conflict of interest like David Bernhardt has no business managing our parks and public lands.